First we create our node.js server. A really simple one. This server will broadcast the message received from the browser to all connected clients. As we can see we are including the js script called socket.io/socket.io.js. This script is served by our node server. In fact we can use our node.js to serve everything (HTML, js, CSS) but in our example we will use only node.js for real-time stuff. Apache will serve the rest of the code (only a HTML file in this case). And that’s all. Those few lines perform the same thing than our PHP and js code in the other post’s example. Our node.js implementation is definitely smarter than the PHP one. The socket.io library also allows us to use the example with all browser. Same code and without any browser nightmare (just like jQuery when we work with DOM). Here I have a little screencast with the working example. As we will see there We will connect to the node server with firefox and chrome. Firefox will use xhr multipart and Chrome will use Websokets. I’ve got a problem within our node.js application. If we’ve got some kind of security within our application (imagine for example it’s behind a session based auth form) we need to share this security layer with our node.js server to ensure that non authenticated users aren’t allowed to use our websockets. I don’t know how to do it just now, but I’m investigating. Do you have any idea? Full code Code at github. Ensure you’re using the stable version of node.js. With the last versión available on github of node.js there’s a bug and server dies when we connect with Google Chrome. 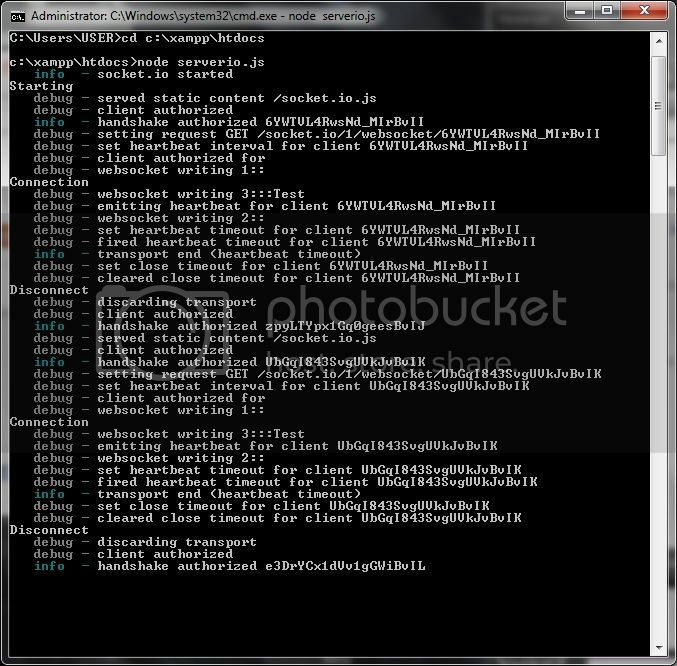 Posted on May 23, 2011, in HTML5, node.js, socket.io, Technology, Websockets. Bookmark the permalink. 43 Comments. Very neat, my fourth time going through this and i get a bit of it, but the notifications work per click/ as you click on a link, am i right? kay before i climb this tree any further, is ti possible to implement email notificatiions with this and a change of events in the database? say i insert a comment…. As I understand with your comment you want to send emails instead of sockets to the node server. It’s a different problem. I don’t recommend to do it innline (simple mail function). It will slow down your script. Maybe it’s better to use a queue system, for example gearman. You can’t choose the transport. Sockect.io decides the transport depending on the browser. For example if your browser allows websokets (the best way) it will use it, if not the best transport available in your browser will be used. That’s the great thing of this library. It’s something like the jquery of the websockets. Strangely this works in Chrome, but nothing displays on console if using Firefox. And Firefox reports errors : io is not defined, socket is undefined. In order to keep the server as light as possible, I’m looking to send data to the client via node.js and then have the client do an sql lookup before updating the client view, but I’m unable to find any examples of that. Is there any reason this *wouldn’t* work? Should I be researching some different avenue? Basically, the server would get notified of a change through some other means (from another user or interface, for example), and would notify the client that it needed to update. Preferably, I would be specific about what needed to update instead of just doing an update for the whole page. Im so very happy I came across your blog! Very high level and I could learn a lot. I’m also a php developer who recently started getting into the world of node.js. This notifications project is exactly what I want to implement BUT my stack is a bit different and my sessions solution ( as I see it in mind ) is also different from your php + node.js sessions post. But I kinda got lost in the architecture and implementation of it all, maybe you could improve this project and have a 3rd post with more robust and full solution? That would be great! so think about Facebook’s notifications feature at the top navigation bar. When a event occur you automatically get notified and also there are aggregated notifications. More over, the user can see ” all of his notifications “. My main system is php based so i thought of adding node.js for real time features and redis for sessions management between the two, and some queue (zeroMQ? RabbitMQ? else ?) for handling the notifications (per each user) eventually ( how will you aggregate the notifications in real time or near real time ). About the sessions between node.js and php redis can deliver Consistency and Persistency (www.cs.brown.edu/courses/cs227/archives/2011/slides/mar07-redis.pdf) which can ensure using the right session while the user is connected. Availability is minor in exchange for both. Will you store all processed ( aggregated or not ) on Db? ( I guess so) what db ? I must admit that I been thinking about how to solve the problem (share sessions between node and PHP) for a long time and I don’t know what is the correct solution. I wrote the post because I thought the problem was in were sessions are located, but now I don’t think the location of the session is the problem. Maybe we need to build a oauth system between php and node.js to trust the connections, but I’m not sure how to implement yet. I will think about it. XMLHttpRequest cannot load http://wundertutor.com:8000/socket.io/1/?t=1356423985952. Cannot use wildcard in Access-Control-Allow-Origin when credentials flag is true. 1.) When I specify the port directly and go to the page served by express, my node app successfully creates a websocket connection but when I go to the main site I encounter the error because it is trying to use XHR polling. 2.) I have tried to set Access-Control-Allow-Origin options is both apache and my node app, as well as on the client side code – none of the options seem to work and I am going crazy trying to figure out the problem. Any thoughts? Hi CORS is an nightmare, but if if you are the sysadmin of the webserver and you should solve it without problems with the Access-Control-Allow-Origin directive. Your error code says without doubt that your problem is with CORS. That’s means that you are in the right way but you are doing something wrong. (http://enable-cors.org/). Check your headers (with firebug or chrome developer tools) and ensure Access-Control-Allow-Origin is property enabled. Now if I go to your url i don’t see the Access-Control-Allow-Origin in the headers. Moreover, Is your site behind a session based auth?. I’m not sure what’s the correct way to work with a site like yours (apache+php to serve the web and node.js for real-time) but behind a sessions (we need to “share” or something similar, sessions between node and php). As I understand your app is a apache/php + chat with socket.io. I don’t really understand where express fits here (maybe to serve static files of chat application). Where is exactly the problem? When you try to use express resources from apache with js? or, When socket.io tries to use XHR in socket.io (because websockets are not available and uses a failback). If your situation is the first one Access-Control-Allow-Origin must be set in the node.js server. If the situation is the second one then you need Access-Control-Allow-Origin within apache. I know is a nightmare, but check with the inspector if your headers are properly set up. Try also to put Access-Control-Allow-Origin in all servers (in your case: apache, socket.io and express) without restrictions (‘*’), and when it works adjust the restrictions. i have a problem with IE browser : “script5 access denied” when i try to using socket.io object .Could you help me with this problem ? ensure that you don’t have problems with Access-Control-Allow-Origin. I have a problem when follow you tutorial. The client never connects to the server. I’m using chrome Version 24.0.1312.57 m, socket.io 0.9.13 but it can’t establish a connection using websocket, always have a request 101 switching protocol in pending forever. When I set transport to ‘xhr-polling’, it works fine. Can you tell me the reason? I have looked for the answer for two days but useless. It stop there and client never connect to server. I test it on localhost, I use only Avira Antivirus, and has no firewall or proxy. I have looked for other socket.io example online but still has the same result. I don’t know the reason. Another problem: I try using ws(https://github.com/einaros/ws) library to implement websocket on nodejs, ok, it connect, but not send data until I close the tab. I’m really stuck with websocket. Are are using one external library to connect to socket.io from browser? You don’t need it. In fact if you want to use socket.io you need to use the js provided by socket.io in the browser (/socket.io/socket.io.js) this static file is served by socket.io. @Gonzalo Ayuso: with socket.io, I’m using your source for all server and client, I just change to ws library for server, raw websocket of browser for client when I can’t find what happen with socket.io. With my log and server debug screen, do you have any suggestion for me? So I just want to clarify is it a good way to display feeds or any changes can be done to make it more better? Auth user and websockets it’s a problem. It isn’t a problem is your all your app is built over node.js, but when you need to handle with two servers (node and PHP application) you need to share the authentication. IMHO the best way to solve the problem is described here: http://socketo.me/docs/push. Really great post, Is it possible to build the Android Client and IOS client for Socket.io server ? or so Socket.io only meant for web based chat ? How scalable it will be as there will be around 1 million active users in a day.How it differs from XMPP protocol. Thank you for your comments. Do you recommend Socket.io + Redis + Node.js is good alternative to Ejabbered with XMPP for high performance Chat application ? . with web sockets your browser need to be open (and connected to the server). For example if you work with a mobile application and you want to send messages while the application is closed, you need to use push notifications. It works in a similar way than websokets, but it’s not the same. How does it work if the “onclick” dom event doesn’t call a function?? Today January 14, 2015 I’ve just read, downloaded the script and unfortunately it does not work.Gonzalo did you mind if you check and re-up the full script to download? Be careful. It’s an old script (4 years old). It worked with the old versions of the libraries. Probably your are using a new version of them. For example socket.io was in beta (or alfa) 4 years ago. Now is stable and api has changed. You can see more recent examples in my blog here (https://gonzalo123.com/category/technology/socket-io/) or maybe better in the sokect.io documentation. I recently worked with this script and modified to work with new version of node.js and io. The majority of the code still works just a little minor changes that will save you hours of debugging. I forgot, I have my port at 8082, so change 8082 to 8080 if you are using port 8080.